A Griffith University physicist is challenging the conventional view of space and time to show how the world advances through time. 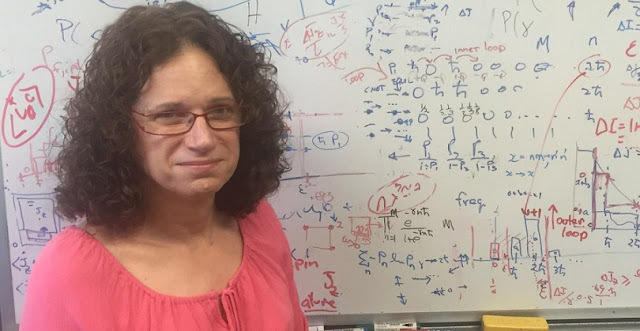 Associate Professor Dr Joan Vaccaro, of Griffith’s Centre for Quantum Dynamics, has solved an anomaly of conventional physics and shown that a mysterious effect called ‘T violation’ could be the origin of time evolution and conservation laws. “I begin by breaking the rules of physics, which is rather bold I have to admit, but I wanted to understand time better and conventional physics can’t do that,” Dr Vaccaro says. In her research published in The Royal Society Dr Vaccaro says T violation, or a violation of time reversal (T) symmetry, is forcing the universe and us in it, into the future. “If T violation wasn’t involved we wouldn’t advance in time and we’d be stuck at the Big Bang, so this shows how we escaped the Big Bang. The anomaly Dr Vaccaro solves involves two things not accounted for in in conventional physical theories – the direction of time, and the behavior of the mesons (which decay differently if time went in the opposite direction). “Experiments show that the behavior of mesons depends on the direction of time; in particular, if the direction of time was changed then their behavior would also,” she says. “Conventional physical theories can accommodate only one direction of time and one kind of meson behavior, and so they are asymmetric in this regard. But the problem is that the universe cannot be asymmetric overall. Dr Vaccaro is presenting her work at the Soapbox Science event held in Brisbane as part of National Science Week, titled “The meaning of time: why the universe didn’t stay put at the big bang and how it is ‘now’ and no other time”. “It just exists at one place in space and one point in time. There is nothing unusual about being at one place in space, but existing at one point in time means the object would come into existence only at that point in time and then disappear immediately. “This means that conservation of matter would be violated. It also means that there would be no evolution in time. People would only exist for a single point in time – they would not experience a “flow of time”. “This means that the theory now has conservation of matter – the conservation has emerged from the theory rather than being assumed. Moreover, objects change over time, cups chip and break, and people would grow old and experience a “flow of time”. This means that the theory now has time evolution. Where can I read more about her work? In which science journal does she publish her work?